Playing for Christmas mass at St. Timothy Catholic Church in Chantilly, VA.
Want to make your event especially memorable? How about hiring a harpist who plays more than Classical music? 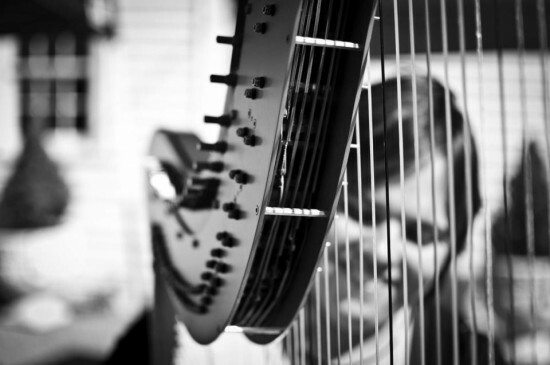 Emily Mason provides a wide variety of music from classical to pop and classic rock- on the harp. 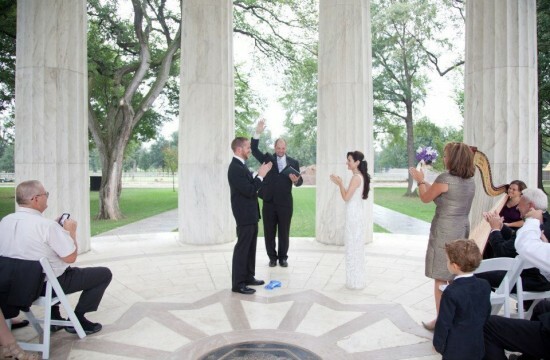 She has been featured in the Washington Post twice; provided music for many weddings, receptions and parties in DC; and has performed at the Library of Congress multiple times. If you want something different and memorable, this is it! Emily was one of the best I have ever heard. I had just been to the Kennedy center for concerts 2 days in a row before she played at my house...she is simply outstanding! Thank you, Carlos! It was such a pleasure to play for your family! I want to thank Emily for an amazing performance . I received raving reviews from all of our guest! Even the funeral home wanted your contact information . I'm so glad my music was just what you were looking for! Emily played for our corporate dinner. She and her accompanist conferred ahead of our event, and their performance was perfect. I HIGHLY recommend Emily if you are looking for an elegant finish to your event plans. Thank you, Julie! It was a pleasure playing music for the dinner! Hired for corporate event. Professional, on time, played beautifully; even arranged for second instrumentalist. Would definitely hire again. We had Emily play our church wedding. She was so lovely to woek with, arrived as she needed and played even our special request songs. If you want an affordable and talented harpist-- Emily is your only choice! Thank you, Gabrielle! It was a pleasure to play for such a beautiful ceremony! Emily played for our mother's 104th birthday tea party at a historic house in Washington. Emily made sure she understood our expectations, she arrived early, she played her selections which were perfect choices marvelously and all the guests remarked on her demeanor, her artistry and how much her performance added to the beauty and pleasure of the tea. She is so talented and delightful. I look forward to engaging her again. Emily never uses sheet music while playing harp, unless playing in an orchestra or ensemble. This allows her to interact with people and surroundings and eliminates the need for a music stand, which obstructs the full view of the harp. Emily Mason grew up in Lynchburg, VA and has been a musician since age seven, singing solo and in choirs, and also playing the piano and organ. She received private Classical piano lessons from very dedicated and competent teachers for nine years, during which time she also studied college-level music theory. From a young age Emily began to gain experience playing for large crowds through participation in many piano concerts, competitions and various performances. 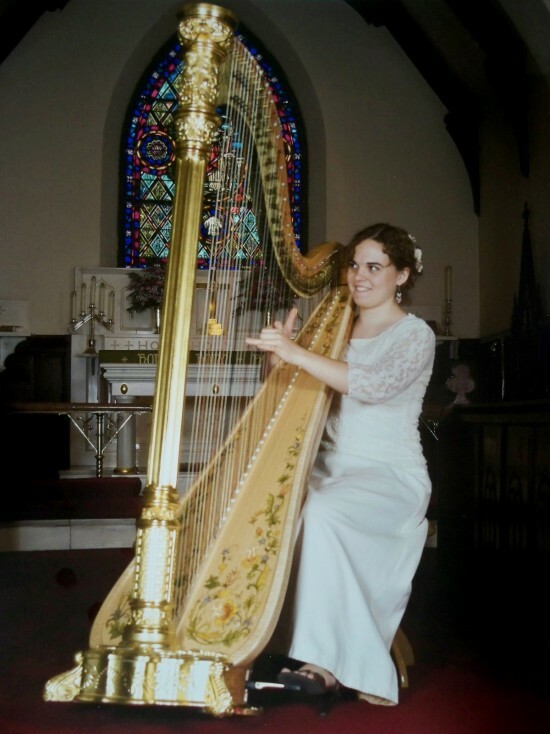 In December of 2005 Emily took up the harp, and under the direction of Virginia Schweninger, the harp teacher at Sweet Briar College in Lynchburg, VA, she quickly grew proficient on both lever and pedal harp. She applied her knowledge of Classical music from the piano and developed her technique on Celtic harp with the direction of such distinguished musicians as Michael Rooney, Gráinne Hambly, William Jackson, and Sue Richards. She gained a thorough knowledge of the harp from being employed for four years by H. Bryan & Co., Harp makers/Restorers as a specialty mechanic, gilder, and overall quality assessor and critic of completed instruments. For two semesters Emily was a member of the Harp Song of the Blue Ridge harp ensemble, participating in the historic 2008 Harps of Gold concert in Lynchburg, VA. The Concert featured seven gilded harps ranging in age from the turn of the 19th century, to harps built in the early 1900's. In September 2009, Emily began to study organ under Peggy Haas Howell, Organist and Choirmaster at St. John's Episcopal Church in Lynchburg. She excelled rapidly with her background in piano, and learned to lead a congregation in hymns, while studying some of the great composers such as J. S. Bach, playing in the 18th century style. Emily was also, for three semesters, a vocalist/instrumentalist for the Blue Ridge Singers in Front Royal, VA; organized and directed a college choral group; was a regular musician for Violino Ristorante Italiano in Winchester for over a year; attended the Church Music Association of America’s 2004 and 2010 Sacred Music Colloquiums; and was also a member of Choir Sine Nomine in Arlington, VA. In February 2010 she moved to Front Royal, VA. Since moving to the DC area, Emily has played for a wide range of events in and around DC, in cities all across Virginia and Maryland, in Chicago and surrounding cities, in New York, Pittsburgh, North and South Carolina, and also several locations in Ireland in December 2010 and October 2014. The venues she has played include the World Health Organization in Washington, DC; the American Hospital Association; the Ronald Reagan Building and International Trade Center; and four events for the Library of Congress. 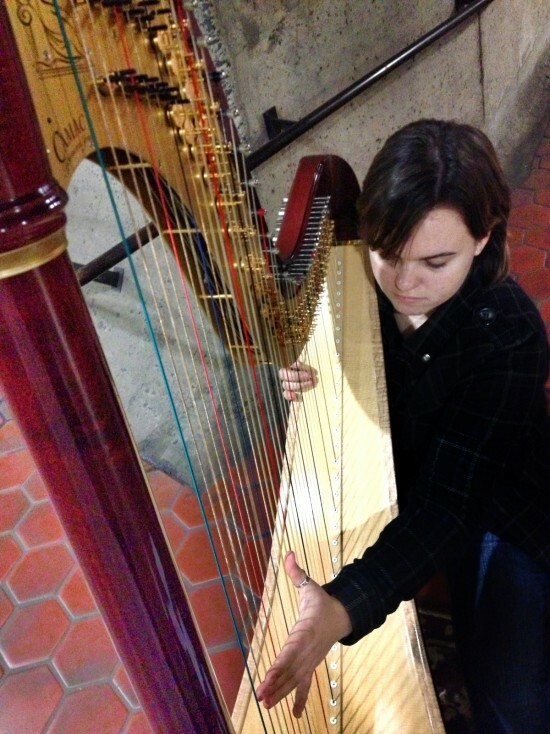 She has been featured in the Washington Post twice, has performed with the Manasas Symphony Orchestra on two occasions, and she can be spotted occasionaly playing at certain metro stops, making the commute more pleasant for thousands of metro riders. Most of her music she arranges herself, adapting it for harp, and she has also begun composing pieces for harp as well as piano. Emily has branched out from her Classical/Celtic music background and now arranges and plays pop, classic rock, and jazz on the harp. A small amplifying kit is available at an additional cost of $40. However, most venues carry the sound of the harp with no need for amplification.